The Residence of France in Kensington Palace Gardens, once the home of the 10th Duke of Marlborough, was the backdrop for an evening to honor TSE on October 23rd, 2018. 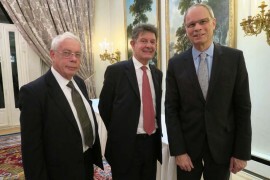 The French Ambassador Jean-Pierre Jouyet hosted the occasion which started with a discussion between the Nobel Prize winner in Economic Sciences, and TSE Chairman, Jean Tirole, and the renowned British Economist John Kay. 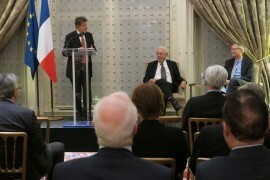 Jean-Pierre Jouyet took an active part in the discussion about the aftermath of the financial crisis of 2007-2008. His reflections and insights were informed by his experience as Chairman of the French securities regulator, the Autorité des Marchés Financiers, then General Director of CDC and President of BPI. 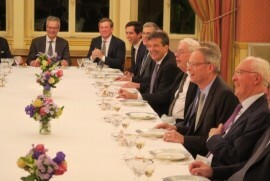 The discussion continued over dinner with the invited guests; topics included Europe and Regulation of the Digital Economy. 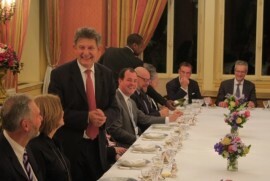 An impressive group included senior figures from the UK financial world, including Bernard Oppetit (Centaurus Capital Limited), Guillaume d’Hauteville (Access Industries), Patrick Ward (Partners Group), as well as other guests drawn from the economic and scientific worlds. Closing the evening, TSE Vice-President for International Affairs and Development Nicholas Rawlins spoke about TSE’s fundraising campaign Toulouse Talent – Global Impact highlighting the valuable support the School has had from British corporate institutions. Tom Coutts (Baillie Gifford) and Soterios Soteri (Royal Mail) each spoke warmly about their associations with TSE; about why their companies had given and the value of their collaborations with TSE’s researchers. TSE and IAST are keen to develop the involvement of the British business community in their activities, inviting executives to give guest lectures, developing interactions with students and researchers and encouraging philanthropic support of students and programs. Promoting current and future Franco-Bristish collaborations is part of our international strategy.